The way we work is constantly changing. Adopting and utilizing the very best technology innovations for your business enables you to increase your productivity and profitability like never before. Robotic instrument technology and the significant performance advantages it can offer have changed the way topography and layout tasks are completed worldwide. Faster, Lighter, Smaller – That’s what the new GPT-9000A series promises … and that’s what Topcon delivers. With a modern, cable-free design, the GPT-9000A series offers the most advanced robotic technology available. 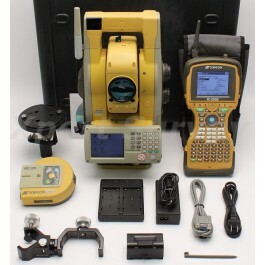 From Topcon, the world leader in optical total station technology. Our GPT-9000A series robotic system features sophisticated technology unique to Topcon – our one-touch quick lock feature that set the standard in Robotic target acquisition has taken another step forward, with the sleek new RC-3 system. Available in 1, 3, and 5 second angle accuracies, you can select the instrument that best fits your requirements. All GPT-9000A series robotic systems offer reflectorless measurement superior to any other instrument available – capable of precision measurements at a mindboggling 2000 meters! The new Topcon GPT-9000A/GTS-900A Series combines advanced technology and modern design innovations. Accuracy ±(2 mm + 2 ppmxD*) m.s.e. Windows CE.NET operating system provides a modern operating environment and added expandability with other application software. The fast 624MHz processor leads in performance and reliability. That’s right, a full 5.17 mega pixel camera with auto focus picture taking ability. That is why we built-in 2Gb of RAM.The camera has an auto-focus function and a flash illumination. Store photos in BMP or JPG format, and if you fill the memory, simply use a common USB flash drive to offload images. The FC-2500 is loaded with all the memory you should need. Primary program ram is 256Mb. In addition, it includes 2GB Flash storage memory. We want you to use the camera and know those file sizes can add up fast. The digital camera doubles as a bar code reader. Laser pointers identify the bar code and scan that information directly into the text field you have your cursor placed. Imagine your stakeout locations having a barcode attached to the stake. Simply place your blinking cursor into the description or point number field of TopSurv and press the Bar Code scan button. The field will fill with the bar code information. There are so many possibilities for this function that we are sure our users will surprise us with unique applications. This operating platform is the most stable in today’s platform offerings. Simple and familiar functionality leads to fast learning curves. It also allows higher resolution images to be processed. The FC-2500 has an add-on connection on the back of the unit to control a spread spectrum radio for robotics communication. Use this connector and an RS-1 to have a cablefree radio connection to the Topcon robotic instruments. Additional packs may be possible in the future. Finally a 55 key alphanumeric keyboard plus joystick unit that can control the Robotic systems. We know that land surveyors typically prefer an alphanumeric keyboard data collector. This FC-2200 can handle the robotic radio as an expansion slot radio. Use the USB mini port as both a Host and Client. This On-The-Go (OTG) functionality allows for expanded memory and easy file transfer through USB flash drives or ActiveSync connection. This design also provides rugged protection. The FC-2500 can not be compromised by opening a card door or flap. The entire unit is sealed and submersible. With two NiMH batteries loaded standard with 2500mAh each, battery performance can be as high as 50 hours. The typical power drain from a Bluetooth connection to a GPS receiver will run for 24 hours. Don’t ever worry about overcharging, the FC-2500 has internal temperature monitors to prevent any unexpected high temperature issues. The FC-2500 is rated at IP-67, which means it can be submersed in water. The unit also has a 4 foot drop proof rating. If you are looking for an alphanumeric controller that provides big-time results, look no further than Topcon’s FC-2500. The FC-2500 field controller incorporates the graphical Windows CE.NET 5.0 operating system on a crisp, bright, color touch screen display that makes your field data come alive. This powerful operating system, combined with the versatility of USB jump drive removable media for data storage and transfer. Capture Reality in yet an additional device from Topcon. Topcon understands that a picture is worth more than a thousand words. This highly advanced camera can be used to associate photos with stored TopSurv points as Photo Notes. For every topo shot, as photo note can be stored. Screen Dimensions 2.89 in. x 2.19 in.